What Is The Best Tire Repair And Sealant Kit in 2019? →What Is The Best Tire Repair And Sealant Kit in 2019? Learning how to drive is easy, but the worries do not end when you become an experienced driver. Whenever you are driving your vehicle, you must be prepared to deal with all kinds of emergencies on the road. Whether it is a snowy, slippery road and you have to place tire chains, or change a flat tire, being prepared for emergencies is important for every driver. Fortunately, there is an alternative, limited-time solution for the second problem. When your tire is damaged on the road, you can use your tire repair and sealant kit to deal with the situation until you can actually replace the tire with a new one. But, purchasing the right one may still pose a problem for you. Of course, you cannot opt for just any sealant kit, since the condition of your tires is very important for your safety. The variety of repair kits and sealant types is enormous, so you probably need some help to make a decision. To simplify this search for you, we created a list of the most promising tire repair and sealant kits for you to use in 2019. What Is A Tire Sealant? How Should You Use a Tire Sealant? When is it Safe to do Puncture Repairs or Change the Tire? What are the Disadvantages of a Sealant? How Do You Choose the Right Sealant for your Car? How Long Can You Drive with a Flat Tire? Fixing your flat tire has never been easier. Thanks to the Slime’s flat tire repair system, you can get back on the road within as little as 7 minutes. 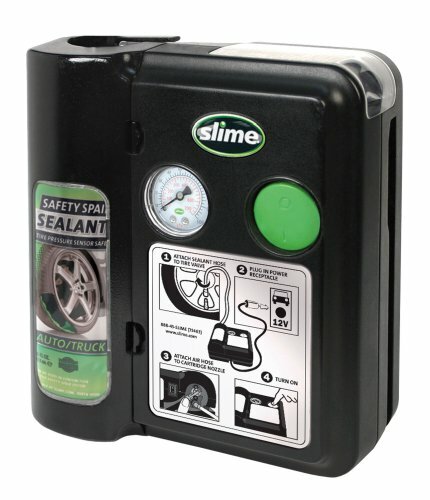 Not only is the Slime 70005 Flat Tire Repair System fast, but it is very easy to use. This makes it convenient for beginners as well as experienced drivers. All you have to do is connect the sealant to the air pipe and press the large button. When you do this, it will seal and pump the punctured tire. Pumping and fixing your flat tire within 7 minutes is made possible with the 12V inflator. Purchase this set of 56 pieces and you can fix any problem with your tire. Whether your tire suffered a tear or a nail gone through it, the options this repair kit provides is sufficient to get you back on the road in no time. 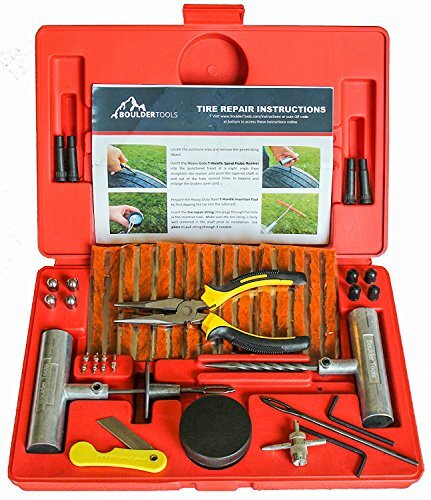 The instruments in this kit include 30 string plugs, a pair of pliers, as well as a variety of smaller pieces you can use on cars, bikes, motorcycles, tractors, trucks, ATVs, and land mowers. So, we are not only talking about a diversity in terms of tools you can use, but also tires you can use these tools on. The kit comes accompanied by detailed instructions, making it very easy to use. As if this is not enough, all tools are made of durable, high-quality material. Fix any punctures on your tire by using this sealant like you would use an ordinary glue. The Fibro-Seal technology used in the Slime 10009 Tubeless Tire Sealant allows you to fix the tire instantly. A single bottle of sealant can do all the difference when you are stuck on the side of the road because of a flat tire. This particular product can treat punctures up to ¼’’ depth, and all you have to do is apply it on the affected area. The Fibro-Seal technology used in its production allows for instant sealing on a variety of cars and is also very easy to wash off with water. In addition, its contents are non-toxic and non-flammable. ixing tires is usually a mess, but not with this aerosol inflator. You don’t need any extra tools if you have this one – it functions as a spray that you use to seal the punctures and inflate the tire. Fix-A-Flat S60420 uses a non-flammable formula that can be washed off with water. By using this simple tool, you can seal a puncture that is ¼’’ deep, and inflate the tire in the process. You don’t need a jack or a T-handle to do the messy business. Instead of this, you can use this product to seal the puncture until you get to your desired location, and keep your tire inflated. With the tire repair kit Vector J&R, you can solve your flat tire issues within minutes. The kit contains 35 pieces and is a complete set for repair and extraction. This attractive kit takes little space in your vehicle, but can mean the world to you when you find yourself in a bad situation. It contains 30 string plugs, one T-handle spiral probe tool, one T-Handle insert tool, and two hex keys. All tools in the kit are made of the same, high-quality material. The metal construction this kit’s items are made of allow for high duration. In addition to the tools we mentioned, the product comes with a sealing lubricant for all tire types. 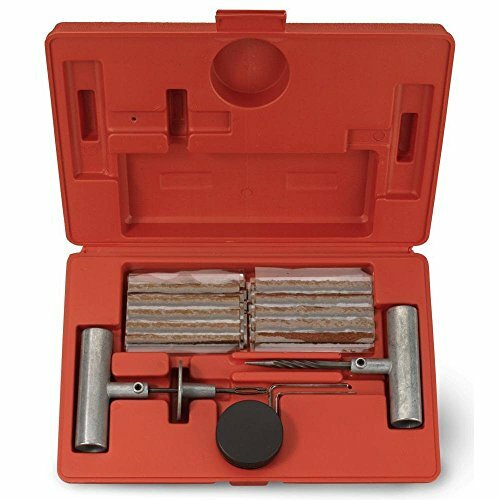 This kit contains every instrument you may need to fix a tire that was punctured, and every tool in the box is made of high-quality, durable material. This is the most versatile item in our list, in the sense that it includes the widest range of tools within. 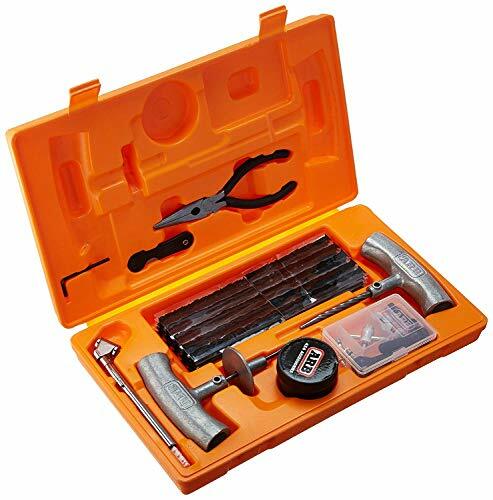 The instruments you will find in the ARB 10000010 Orange Speedy Seal Tire Repair Kit are made of durable material and stored in a compact case that won’t take much space in your vehicle. You will find many tools in the case, including valve accessories, lubricant, reamer tools, insertion tools, pencil-type tire gauge, self-vulcanizing repair cords, etc. In a tire emergency scenario, you can use the 8-step instruction manual. Complete with exactly 48 pieces, the Slime 70004 Power Spair Tire Repair Kit is very rich in content. The handle at the top of the case makes it easy to carry and is compact and easy to store. 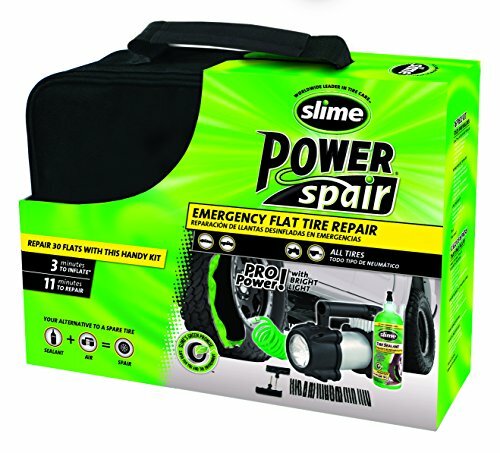 Another kit rich in content, the Slime’s Power Spair Kit allows you to handle any flat tire crisis. The package includes a T-Handle reamer, a universal tire sealant, air adapters, 30 repair strings, valve core removal tools, etc. The 12V inflator pumps air and can inflate a standard tire in less than 12 minutes. The sealant in the case is made of a Fibro-Seal technology, making it possible for you to immediately seal and inflate the tire without replacing it. Of course, this is not a long-lasting solution, but it sure comes handy in emergencies. Most cars nowadays do not come with spare wheels. If you want to have a spare in case of a flat tire emergency, you need to purchase and store one in your vehicle. Sometimes storing a tire is not possible, or you can simply forget to purchase a tire. In an unexpected tire problem situation, you need a solution that will get you to the closest tire store. A tire sealant is not a permanent solution, but an excellent temporary repair. It is usually based on a latex formula that will stop the leak and get your car to the closest garage. Changing a tire is not simple, especially not for a person who is not experienced or familiar with this process. It starts with jacking up the vehicle, loosening the tight bolts, removing the old tire, and installing the new one. It can take plenty of your time and expose you to dangers if you are stuck on the side of the road. In order to change a spare tire, you need a flat tire kit like the ones on this list. A sealant is a temporary emergency solution, but a much quicker and easier one. However, this solution is not suitable for all puncture sizes, so make sure to check the sealant before purchasing it. If your tire is driven after the puncture was made, the damage may be impossible to fix with a sealant. Every sealant has the same principle, but there are different applications. The best answer is the one you will get from the manufacturer. Fortunately, almost every sealant comes with operating instructions. Carrying out any repair or replacement on the side of a very busy road can be tricky. If your life is in danger, we recommend calling out an emergency recovery service. However, if you do decide to take the matter into your own hands, it is better to seal the tire instead of replacing it completely. This is a much quicker and easier option, and will reduce the risk to your life. Of course, that is if you have a tire sealant, know how to use it, and can use it on the puncture. If you do find a safe spot, you may want to replace the tire altogether, since this is what you’ll have to do afterward, anyway. Do not be mistaken – the sealants in this list, or any sealants for that matter, cannot permanently repair your tire. Your tire will still need to receive a stronger, permanent patch or be replaced altogether. If you do decide to repair the tire with a sealant, you must be careful to use one that does not contain hazardous chemicals. In addition, it should be one that is easy to remove from the inside, so that you can replace it with a traditional patch afterward. Some sealants are canned and dangerous to the person who is doing the repair. This happens when the sealant creates high pressure inside of the tire. There are some sealants that fit most vehicles, but you should definitely check before you make a purchase. Most cars are fine with the can of standard size, but you may want to purchase a larger sealant if your tires are of larger size (tires of trucks, SUVs, and other large vehicles). In addition, you should look for a sealant that won’t destroy the tire or expose you to a risk. Experts agree that you can only drive for a maximum of one mile on a flat tire. However, driving with a flat tire is not at all recommended, so we suggest that you try to pull off to the side of the road as soon as possible to prevent any further damage. Prevention is always better than a complete replacement, so you should definitely consider sealing your tires in emergency cases. With the list we presented you with above, you can find quick and easy solutions for your tire problems. Whether you want to replace a tire or seal it as a temporary solution, having these items in your vehicle is never a bad idea. Whichever option you choose; you should definitely have something for such emergencies. But, do not take this task lightly – choosing the right kit or sealant is very important and can literally save your life in an emergency.